We believe that the starting point to a great guidebook is clear mapping. 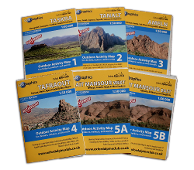 All of our guidebooks feature custom GeoGraphics topographic maps, which are also available to purchase in sheet form. The OAC currently publish the following map series, all of which are available for sale in our store. Printed on tough, waterproof, and tear-proof paper, these detailed A1maps are ideal for exploring complicated terrain on foot. As well as ultra-clear elevation and contour shading, they feature 10m contours and crag shading. Printed on the same ultra-tough A1waterproof paper as our Adventurer series, the RANGER series cover a large area at 1:50,000 scale - ideal for exploring on foot or on two wheels. Clear contour colouring and terrain shading make them the ideal trekking map in mountainous terrain. These super-handy minimaps are designed to fit easily into a pocket or backpack lid, and are really easy to use out on the hill thanks to their A2 size. The original series were printed on standard paper, but all of the new OUTDOOR ACTIVITY MAPS make use of almost indestructible waterproof paper. These mid-scale maps are ideal for exploring by car or bike, giving large-area coverage on a handy A2-sized sheet. They are perfect for exploring minor roads, tracks, and pistes in mountainous regions.